Our plastic canvas coaster patterns can be custom made to match your decor when you follow the directions to change the colors of yarn in the patterns. Matching Coaster Holder Pattern included. Bonus: The PDF Version contains the additional coaster design shown. The PDF Version of this project contains both designs shown. Includes all patterns and instructions for this entire project without margins, ads or logos. Bonus: The PDF Version contains the additional coaster design shown. Coasters: Purchase pre-cut 4" squares of 7 count plastic canvas or cut your own from 7 count plastic canvas sheets. Your squares should measure 27 square holes x 27 square holes. Coaster Holder / Napkin Holder: Cut the following pieces from sheets of 7 count plastic canvas. Cut 2 for Front and Back: 48 holes x 35 holes. Cut 2 for Sides: 13 holes x 35 holes. Cut 1 for Bottom: 13 holes x 48 holes. Stitch all your pieces according to the patterns given. 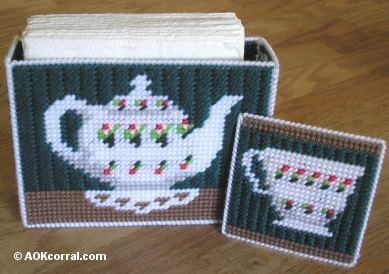 To stitch the bottom for the coaster holder / napkin holder, stitch the piece in the same color as your background color and with the same horizontal or vertical lines as on the other pieces in the pattern of your choice. Using the color of yarn you want for the edges begin by securing the end of yarn under several stitches on the back of the coaster near the edge where you will begin. Bring your needle over the edge, around to the back again (or for double sided, to the other side) and then send your needle through the next hole. Continue doing this all around the edges of the coaster and secure the end of the yarn under several stitches in the back (or for double sided, on the inside along the edge). This will form a nice finished yarn edge. Line up the holes of each piece that you are joining. Secure the end of the yarn by sliding it under several stitches on the back of one of your pieces near the corner where you wish to begin. Continue joining the piece by looping through each pair of holes in this manner. Join the sides of the holder to the front piece and then stitch the back onto the other side edges. Then, stitch the bottom of the holder on by stitching all the way around the connected front, back and sides. Finish the holder by stitching around the top edge in the same way that you finished the edges of the coasters. Use the info on the color chart to change the colors to match your home decor or to make some coaster sets for friends.